We are experts in running successful speed dating events as well as general social/activity events. If you are looking to start a speed dating business or a general events business, Why do it alone, when we can work together and you can leverage our years of experience in the industry? This will be your own business, with your own website, but you will not have to start from scratch! We are not going to hand you an events dating kit and say "good luck." We will be their every step of the way. If you succeed, we succeed. Lets do this together! The following pertains to hosting events outside of New York City and Long Island. If you are looking for information on hosting events within Long Island and NYC click here. Are you ready to be a star in your community and start spreading the love and make a few bucks as well? Run your own business!, but not be in business by yourself. 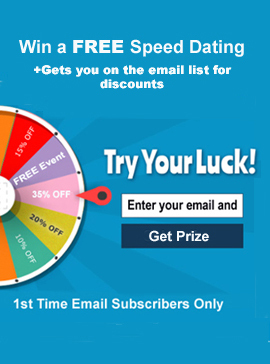 Host your own speed dating and singles events and keep 65-80% of the event sales. Expand your social circle, make new friends and cross promote your other businesses (if you have one)! Make a difference in people's lives. Training/Coaching- Full training via phone and email will be provided on an ongoing basis. This will include assistance with advisement with regard to marketing, facilitating events, customer service, venue selection and other duties related to organizing and conducting events. We will teach you step by step how to run your own successful events. Website & Domain- You will be provided with your own domain name, website and robust back end administrative system software (used for building events) Speed Dating module is also included. Search Engine Optimization. The website will its own domain name, but you will benefit with "link juice" from our Parent Websites. This will be your own small business and we will be your coach on an ongoing basis. You will have the advantage of leveraging our proven system of running successful events. If you have another business (e.g. Real Estate, Financial Advisor, Life Coach), the events will also be an ideal way for you to cross promote your existing service in a non-salesy way. As the event organizer, you automatically have â€œsocial proofâ€ and will begin to develop a rapport with attendees who may come back on a continuous basis. We have spent thousands of dollars over the past 15 years with custom development of the website and back end software systems. The initial cost to become a licensee/mentee is $700-$1500 and you will keep 65%-80% of the event sales. Starter Kit- You will need a starter kit that includes letter holders, stopwatch, portable address system, business cards, name tags. We would guide you on where to get these items in the most cost effective manner. Someone who is self motivated and is looking to take ownership of a small territory. Presentable. You need to have a good sense of style and make a nice appearance. Personable. People are nervous when coming to a singles event and part of your responsibilities would be to make them feel welcome. Someone who is able to think on their feet and think outside the box when necessary. When you deal with the public, you never know what can happen. Must be computer savvy, a self starter and interested in learning about Social Media. Financially Responsible- To qualify, all organizers must have a credit card. This provides us with an additional check to ensure the organizer is financially responsible. Organized and pays meticulous attention to details. to help promote the events. Filling the room- Running the events is the easy part. One of your main responsibilities will be to handle the marketing and get participants to take part in the event. We will help you. Securing event venues- The Contractor will identify and secure appropriate venues. You will follow our proven system to get quality venues. Answering and returning phone calls/emails from interested individuals. Marketing, advertising and promotion of events. This may include leaving promotional cards and flyers with local businesses, attending trade shows, getting lists of local sources that publish singles events. Organization, Preparation and facilitation of events by building specific events online, generating print materials, and running events. Processing and sending results of matches to participants within 14 hours of the event. Shall fulfill any other duties reasonably requested by the Company and agreed to by the Contractor. A full background check including searches of driver records (looking for DWIs etc), criminal records, credit report, civil litigation, rent/prior employer references and others searches would be conducted. You would also be required to sign a non-compete agreement, enforceable for 24 months. Applicants with DWI or criminal convictions will not be considered. 1) Email Jay Rosensweig at Info@Weekenddating.com to request an application. Submit the application and resume along with a current photo headshot for consideration.